Am I the only one who finds it heart-wrenching, ridiculous and WRONG that zoo animals are better housed, and legally have higher living standards than horses?? I did not grow up around stabled horses. I was not taken to riding lessons at the age of 7 or 9 and taught to look at all the happy horses behind bars with their (usually empty) hay manger and possibly a ball hanging down for them to play with when they’re bored – aren’t they lucky to have such nice, cosy stalls? Aren’t they lucky to stand caged in their own ammonia fumes, with zero space to walk out their aching backs or the knots in their haunches? Aren’t they lucky to be vitamin D deficient from lack of sunlight and have to dissociate from their physical body in order to survive their captivity? Oh, and look over here, here are the horses outside in their 10×20 foot paddock – isn’t that nice, in the fresh air and sunshine? How lucky, they can even walk 8 steps in a straight line! What a suitable, natural habitat for a horse – one that would surely pass the approval process for any zoo animal – NOT!! The very sad truth is that the current accepted standards for horse habitats in the UK, US and Canada would be considered unacceptable and constitute animal abuse in any of these country’s zoos. And I guess this is where horse owners are granted the big FREE PASS on humane animal standards. Because really, any horse ethologist will tell you that horses in their natural habitat will range 20 – 30 miles per day. Realistically, who can provide that for a horse? So rather than go without horses, we choose to throw that basic standard of humane horse care out the window. But wait a minute; just because we cannot provide a habitat that facilitates their “typical behaviours and movements”, does that mean we give up entirely and put them in the equivalent of a dog crate for 22-23 hours a day? I checked the horse stabling minimum requirements in a few different countries and basically, yes, you can legally cage a 15 hh horse in a 12×12 foot stall, or a 16 hh horse in a 13×13 foot stall (see Reference section below). If you think that’s fine. Then try this: Go lock yourself in your bathroom for 12 hours, or 23 hours, or however long your horse is stalled for without any exercise. You are not allowed any devices, or books, or phones. Just you and your excretion facilities – and you can have food delivered 2-4 times per day. Your family or friends can talk to you from across the hallway if they wish. Oh and consider yourself very lucky if your bathroom/stall has a window! How many days do you think you’d last before you started to dissociate from your physical body and suffer mental/emotional trauma? I took a moment to consider things from his perspective, before I launched into all my justifications. And of course, he’s right. While it’s much better than a 10×12 foot stall, or a 20×30 foot paddock, 5 acres is still nowhere near a natural habitat for a horse. They are still being confined to a very small space where they cannot walk their typical 20 – 30 miles per day. Or can they? And this is where we can be so grateful to people like Jamie Jackson, who studied mustangs on the BLM lands for several years and discovered that, rather than wandering randomly, the horse herds actually created their own routes, or tracks in a set pattern. This track took the herd through varied terrain, mineral flats, watering holes, salt licks etc. In his landmark book, Paddock Paradise, Jamie shows us how to create this kind of track that gets our horses walking all day, on as little as an acre or two. So although your horses may not be able to range like they would naturally, at least they can be moving and ‘foraging’ all day and passing through varied surfaces, hills, watering holes etc. that you create for them. Jamie’s book tells you how to do all of it and there are many different blogs that have sprung up where people show you exactly how they have set up their own unique “paddock paradise”. 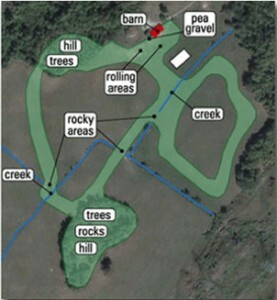 There is even a second book available by Joe Camp that outlines how he created his walking track for 6 horses on only 1.5 acres of dry land, Horses Without Grass. Is it ideal? No. Is it better than caging those 6 horses, or having them stand day after day in a small outdoor pen? Hell yes! There are even boarding facilities now that have converted to this system – so be sure to use Google to check for one in your area if you board your horse out. Note: “Animal”: Any vertebrate other than a human being or a fish. (pg.21) So this definitely includes horses! • All animals must be maintained in numbers sufficient to meet their social and behavioural needs (unless a single specimen is biologically correct for that animal). Exhibit enclosures must be of sufficient size to provide for the physical well being of the animal. All animal exhibits must be of a size and complexity sufficient to provide for the animal’s physical and social needs and species typical behaviours and movements. Exhibit enclosures must include provisions (e.g., permanent and/or non-permanent features and structures) that encourage species typical movements and behaviours. • Enclosures must be of sufficient size and design to allow individual animals the opportunity to avoid or withdraw from contact with other animals in the enclosure or remove themselves from the view of visitors, using topography (e.g., large earth mounds, large rocks), fixed features (e.g., fences, walls, screening, shelter boxes), moveable fixtures (e.g., brush piles, root balls) or other design methods. Wow – imagine that: A stall big enough for the horse to be able to withdraw from view of visitors! Funny how what’s established as a legal right of zoo animals is considered ludicrous for horses. 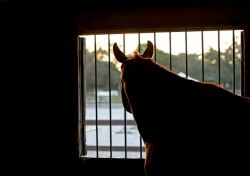 And in fact, many horse owners would be upset if their horse regularly exercised his option to withdraw from visitors. Oh I know, this issue is absolutely fraught with emotion! And guilt, and feelings of helplessness, frustration, overwhelm. Believe me, I had to board my horses at other people’s operations for a long time and it drove me bonkers! All I’m trying to do here is instigate a more independent review of horse care standards in the western world. And I don’t think this review body should be staffed with horse people! Because we are all brainwashed to some extent. I think it should be staffed with Zoo keepers – who are experienced at evaluating species-specific needs and behaviours – and equine ethologists (who don’t own stabled horses!). • There must be a written document outlining an enrichment program for each species, species group or species assemblage (if appropriate) at the exhibit level that may include fixed features, non-fixed features and how food is made available.• Fixed features might include contoured surface topography, giant rocks, mature trees, streams, pools, walls and screens. • Non-fixed features and novel objects might include small trees, branches, logs, log piles, small rock piles, brush mounds, root balls, moveable sand/bark/mulch pits, sod, other novel substrates, burrows, nesting boxes, pipes, tubes, visual baffles, shade structures, moveable climbing apparatus, platforms, hammocks, bungy cords, rope ladders, hanging rings, scratching posts, sprinklers, water jets, rafts, brushes, puzzle feeders, boomer balls, nylabones, traffic cones, wooden rings, and cardboard boxes. Vertical structure is important and a useful stimulant even for normally terrestrial animals. How many of these criteria are met within your horse enclosure? Jamie Jackson’s book, Paddock Paradise, outlines the need for varied terrain in the walking track that provides horses with the movement they need – gravel of different sizes, a sandy area, climbing piles or hills, a water pit – and the ability to engage in species-specific behaviour. Like bathing or playing in water and then rolling in sand or dirt. I mean, what could be more fun than climbing a gravel pile? 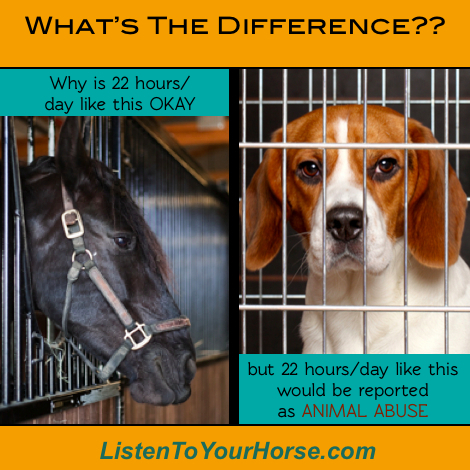 So now that you have a much better idea of what constitutes humane (non-abusive) standards of animal care… how does your horse’s life measure up? Maybe share this post with others at your boarding facility and discuss how you could approach the owner as a group to suggest better standards of care. Get Jamie Jackson’s book, Paddock Paradise, and then lend it to your boarding facility manager. 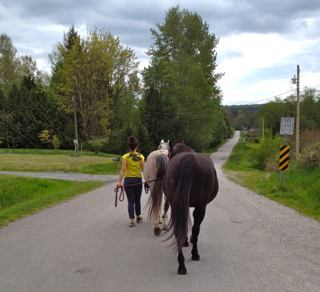 Or show your boarding manager other horse board facilities that utilize walking tracks, like this one. Team up with other educated, dissatisfied owners and lease a field together, where you can set up your own paddock paradise – remember, you only need an acre or two. Advertise on Craigslist or local horse organizations to find like-minded horse owners to collaborate with. At the very least, install a slow feeder or hay net in your horse’s stall and take her out for walks in nature every day – where she can graze on grass by the side of the road and stretch her legs without the weight of a rider or saddle on her back. Then give her exercise in your usual manner. Make sure your horse is seen monthly by an equine chiropractor. Learn to do horse massage yourself, so you can ease his aches and pains from being cramped up so unnaturally. 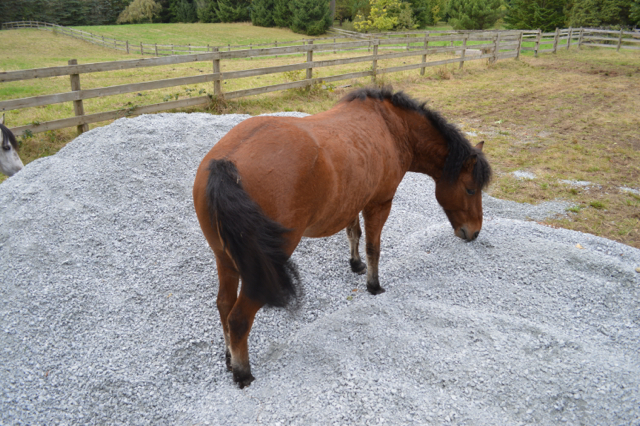 Give her extra magnesium in her feed to help muscles stay relaxed and not cramped. Make sure he is getting adequate Vitamin E and Vitamin D along with the full spectrum of necessary minerals, vitamins and oils (unfortunately your packaged feed likely does not contain adequate amounts). – Horse Welfare: Minimum Standards for Water, Feed, Care and Shelter in Tennessee, The University of Tennessee by Fred Hopkins, Professor, Large Animal Clinical Sciences et al. – Raabymagle and Ladewig, Journal of Equine Veterinary Science 26:11-17, 2006; Zeeb, Applied Animal Ethology 7:391-392, 1981. 1. Shelter in the form of a structure must be available for horses in cases of extreme weather conditions (below freezing temperatures, excessively high temperatures and/or humidity, high winds, excessive rainfall), regardless of the horses’ age, breed or body condition. 2. Any enclosure where a horse is primarily kept shall be of sufficient size to enable the horse to comfortably stand up, turn around and lie down. 3. The minimum ceiling height must be 1 foot above the horse’s head when held at its highest level. 4. All enclosures and shelters must be free of hazards that may cause injury to confined horses. 5. excessive feces, urine, mud or other waste products must not accumulate within the housing enclosures or to the extent that these cause unhealthy conditions. 6. Ventilation in enclosed areas must be sufficient to control excessive ambient temperature and prevent the accumulation of toxic gases, such as ammonia. – California Health and Safety Code 25988; FASS Standards, 3rd ed., January 2010, pp. 17-22. An appropriate space allowance, in m2, is 2 to 2.5 times the height of the horse (at the withers) squared (4). This space allowance allows for the normal movements of the horse, including lying down. Sample calculation based on the above formula for a horse that measures 15 hands at the withers: (Step 1) 15 x 4in = 60in, which converts to approx. 1.5m; (Step 2) 1.5m x 2 = 3m; (Step 3) 3 x 3 = 9m2. NOTE: 1 metre = 3.28 feet. So 9m2 = 10×10 foot stall. At 2.5 times the horse height, the stall would be 12×12 for a 15 hand high horse. For a 16 hh horse, 16 x 4 = 64 inches, which converts to 1.625 metres; 1.625×2.5=4.06; 4.06×4.06 = 16.5m2 or 13.3×13.3 feet stall. This is almost a foot and a half larger than the standard 12×12′ stall you see in most barns. 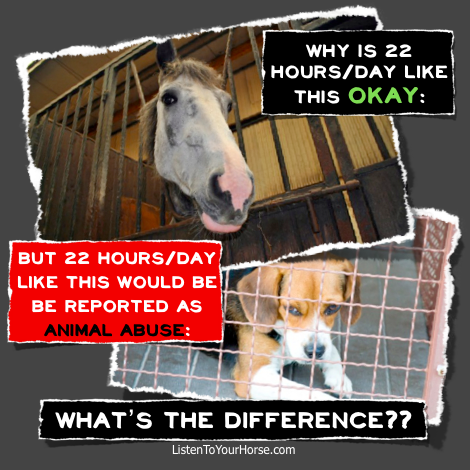 Although nowhere near humane, at least you have a legally-defined place to start asking for better stabling! 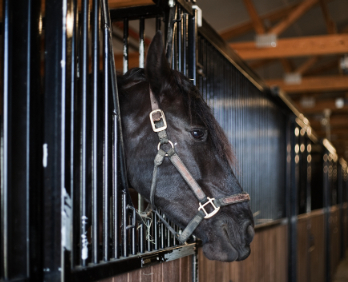 For indoor facilities: each horse must have enough space to lie down in a normal resting posture, stand with the head fully raised, walk forward and turn around with ease. For tie stalls, each horse must have enough space to lie down in a normal resting posture, stand with the head fully raised and step forward in comfort. For group housing, there must also be sufficient space for subordinate horses to escape aggression. I know, when you talk to non-horse people about it they simply cannot believe it’s true. They can’t believe people are legally allowed to cage horses all day, day after day, and the SPCA or animal welfare doesn’t step in. I an definitely with you on all of this. But how can people without acreage solve this issue especially when there aren’t many boarding facilities that have the same mentality as us. That’s where the problem lays. And of course for those people who do have land but choose to still stalk their horses is just sickening. Well I think we’re into the same arena as “people who live in apartments shouldn’t have large dogs”. At some point we have to make a choice (or legislation has to make it for us) that if we cannot keep an animal in a humane, enriched environment, then we shouldn’t keep/own that animal. Personally, if you told me I had to live in a cage my entire life, I’d say, “Kill me now!” And I don’t say that lightly. But that’s just me. Perhaps there are horses that are happier to be caged than dead. Or dogs that are okay being locked in the bathroom for 10 hours while their owner is at work. You also have to look for creative solutions. Right now, I’ve been asked to leave the 10 acre pasture where my herd currently is. As I look around for alternatives, all that is available (during the rainy winter when horse’s hooves tear up the grass) is stalls with little paddocks attached. But I won’t subject my horses to that. So now I’m looking at sending them anywhere from 4-16 hours away, where they can be on pasture. If I can only see them every month, or every week, then that is better than imprisoning them. It is better that I suffer the consequences of my not being able to have my own land for them, than they do. I’m also looking at relocating; because land is much cheaper elsewhere and perhaps this is the sign from the universe – the motivation – that will move my whole family to something better. Life is all about choices, but the more we can give ourselves permission to think outside the box, the more fulfilled lives we lead. That’s my experience anyway! Yes absolutely! If people in boarding situations got together and asked for a walking track (for example) the owner might feel that was important enough to provide it – especially if faced with the loss of revenue. As the paddock paradise concept spreads, there are many boarding situations that advertise this as their “unique selling point” the thing they have that makes them uniquely desirable to paying clients. So your approach is excellent; it starts with education and then as enough people become educated, they can coalesce around a requirement and wield some economic power to make it happen. Nice. Uh, what are you all going to do about dairies and feed lots?? Cattle are EATEN – did you know that? I agree… and have been calling stalls “cages” for decades. Even when I ran a horse back riding vacation business in which my horses were ridden for many hours each day, they each had access to large paddocks open to every stall, and most horses were paired up with 1-6 companions, so they could mutual groom and keep each other moving. No horse was ever confined, even to a 12×16 ft. stall, unless injury required it for a short period of time. When not being ridden, they were turned out in an 84 acre rolling field, or turned loose on our 300 acre mountain side ranch. Many of my clients were amazed that I “risked” turning my valuable horses loose together with no shelter except the surrounding redwood forests, in which they clearly made their own bedrooms during inclement weather. My horses and I wouldn’t have it any other way! That sounds like the best working horse set-up ever, Lari! Thanks so much for posting here and letting others know it can be done in a way that takes care of horses’ basic needs/rights and still facilitates a profitable business. I’ll bet you had a much lower rate of injury and illness than other trail riding businesses too. However, although I know that logistics can make this difficult, after a day of work (or even a normal day) I still don’t think it’s okay for horses to be confined to paddocks. There is still not enough room for them to move, stretch out the kinks, roll, play, etc. Maybe if they had pasture (2+ acres) turnout until dark and then were moved to the open stall/paddock area – so they were still easily accessible for work the next morning, that would even be better… Again, not sure what was possible with the logistics of your set up, but thank you for going beyond the “norm”. Dressage and hunter/jumper stables – take note! Excellent!…thank you! Once again, some great truths that show stalling for the majority of a 24-hour day is detrimental. It is no wonder that at least 90% of racehorses suffer with gastric ulcers! Among other afflictions! Have you read “Saving Baby: How One Woman’s Love for a Racehorse Led to Her Redemption”? Excellent book. I certainly have…I am in it. Jo Anne and I work together – we first met when she founded CANTER and I shortly thereafter became a board member and track committee chair. We both left CANTER by 2008 and we co-founded Saving Baby Equine Charity. I also write true accounts for Horseracing Wrongs. That’s awesome! And very nice site – it’s good that you are ‘bearing witness’. Thank you from all of us! i pasture board my horse .. her pasture is about 2 acres with a 12×12 run in with a raised floor and rubber mats, the pasture itself is set up with short sections, 10-50 ft lengths, of single strands of cotton rope that we placed at different angles so she has to walk around them to get to the other grass areas, the shelter, water tub and grain bucket, almost like an obstacle course or maze. While she is kept by herself, she does have 3 horses on either side of her so they can talk over the fence and even groom each other. Sounds like you’ve set up a “Paddock Paradise” style walking track – sure wish you could post a picture! Oh, can you post a link to a picture or two? This is wrong horses should be out grazing as that is what they do. Not kept in stalls where they can’t move no one has the the right to subject horses to this kind of life. Anyone who thinks this is acceptable does not deserve to own a magnificent animal like the horse. Something should be done to stop this cruelty. 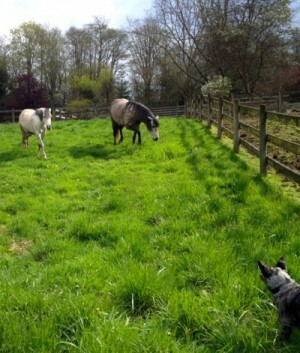 Lots of good suggestions for improving quality of life for domestic horses in this article. However, I have a bit of a problem with the constant refrain that we can’t match their life in the wild. It’s true, we can’t – but our domestic horses are not wild horses, and even wild horses don’t lead ideal lives – they suffer from hunger, thirst,predator attacks, and generally die fairly young. A 30 year old Thoroughbred is going to require much different conditions than a 10 year old mustang. And if you look at pictures of wild horses taken at the end of a tough winter, or during drought, you will see body conditions that would, and should, land any owner of a domestic horse in hot water with the authorities. Wild horses don’t travel 20 to 30 miles a day because that is an optimal distance for a horse to travel, they do it because they need to cover this amount of distance to access the resources they need to survive. More space and social interaction are good goals, but there is no need to duplicate conditions in the wild, nor would it be to our horses’ benefit if we could. You make some good points Simone. I remember watching the Cloud documentary (following a wild horse herd over several years) and wincing at the state of the mares – pregnant year after year, their bodies were thrashed by age 6 or 7. And thinking to myself, “Bet those mares would like a break from endless pregnancy/nursing!” So yes, very true about the poor condition the horses can be in and the fact that they would likely not travel that much each day if they had enough to eat in a smaller range. I think the reason everyone references wild horses is due to the strength and condition of their hooves. And this is what the Paddock Paradise setup restores to horses. It also eliminates the obesity, diabetes, laminitis, etc. that plague so many domestic horses. However, the flip side of many Paddock Paradise (walking tracks) that I’ve seen is that the horses often lack a large enough ‘free area’ where they can run/play at liberty – change directions, etc. The better ones provide large, round or square areas to facilitate different spatial play or rest, but some are just a rectangular (long, narrow) track. Which is MUCH better than stalls or paddocks, but still not ideal. Thanks for talking about how the legal minimum requirements for horses aren’t really enough if they are going to be housed there for the majority of the day. 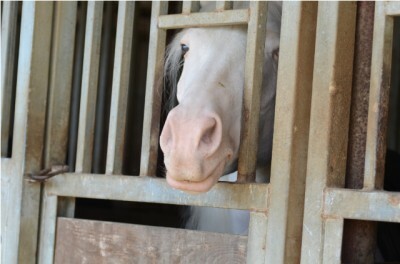 I love animals, and I want to give my horses shelter from the weather, but I also want that to be comfortable for them. I will take your advice and set up stalls that have enough room to move around, in addition to creating a track that encourages exercise and foraging. Great price too – wish we had something at this price point in Canada! We set up one of the largest Paddock Paradise systems at Happy Horse Training in the south of France over 10 years ago, and we stopped bringing the horses into stables. It’s been a hugely positive experience for both the horses and for us! Many people who are passionate about training and riding are stuck in the belief that horses have to be kept in stables to be in optimum condition for performance. I just want to say that this is absolutely not true – there are only advantages of a holistic lifestyle for the horse’s health, fitness, suppleness and trainability. When you train correctly, a basis of calm in the horse is essential, since relaxation (in mind and body) is the foundation of any correct gymnastic training. Horses ONLY have this calm when their basic needs are met – a stimulating environment, a natural diet, and the company of a herd (whether big or small). Only then will your horse be ready to connect with you in a relationship of mutual trust, and to accept the guidance of training without the resistance that underlying tension causes. I sincerely hope that more people will realise the numerous damaging effects of stabling, and that more holistic facilities will open up for horse owners all over the world.